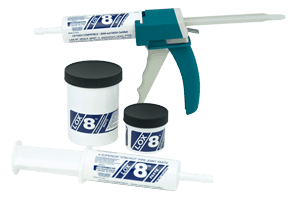 Use Lox-8 Paste thread sealant with harsh or aggressive chemicals. LOX-8 Paste chemistry is engineered for harsh chemicals applications where extreme acids or powerful oxidizers are used. It prevents stainless steel galling and it is a sealant that can withstand high pressure, and both high extreme and cryogenic deep freeze temperatures. Oxygen-safe, waterproof, and versatile, it is an all-purpose sealant and anti-galling agent. Works great with oil-based systems, hydraulic oils, and fuels. LOX-8 is recommended for use as both a lubricant and as a sealant by The Chlorine Institute members. Formulated for wet conditions and dry applications. High-density, inert thread sealant. Remains stable up to 550°F. It is nonflammable and nontoxic. Allows you to standardize on one sealant, replacing all the pipe sealants in your tool box or factory. Eliminates plumbing errors, standardizes inventory and practices.